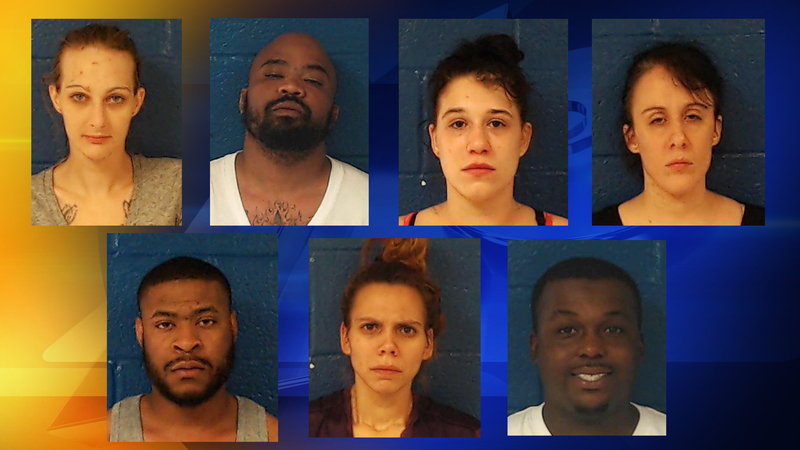 ROCKY MOUNT, NC (WTVD) -- Nash County sheriff's deputies arrested seven people Sunday in a drug bust at a Rocky Mount motel. It began when deputies were called to check on suspicious activity at the Super Star Motel at 3226 S. Wesleyan Blvd. Deputies searched a motel room and found five bricks (250 bindles) of heroin, three grams of marijuana, and $359. Cierra Danielle Corbitt, 28, of the 100 block of Dogwood Drive, Tarboro. All were charged with one count of trafficking opium or heroin, one count of felony maintain a dwelling for controlled substance, and one misdemeanor count of possession marijuana up to an ounce. All received a $275,000 secured bond and their first appearance was set for Tuesday in Nashville District Court.